A NOTE ON THE ARCHIVED FILES. Because we do not want to delay worldwide access, we have ARCHIVED FOLDERS for ALL scanned images of every specimen processed for thymidine autoradiography. The images are unlabeled high resolution jpg files you can download and open with a variety of image viewers. Zooming up to the 100% magnification level and beyond will reveal cellular details–zooming down will show exactly where you are in the slice. In the distant future, we will select several slices from each specimen and label them. But much can be learned from examining the many specimens that are presented here in their “native” state. See the explanations below for a guide to the various groups of specimens injected with ³H‑thymidine. You can also go directly to the Thymidine Autoradiography part of the NAVIGATION PAGE to see the image sets available. SOME HISTORY. 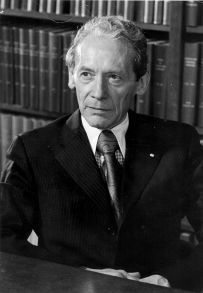 In the late 1950s, Charles Leblond was the first to use ³H‑thymidine to examine cell proliferation in the nervous system. He called the technique “high resolution autoradiography” because the cells that absorbed ³H‑thymidine would show black dots (reduced silver grains) directly over the nucleus when they were coated with liquid photographic emulsion. Variations of ³H‑thymidine autoradiography were used by many laboratories to study cell proliferation, including the Laboratory of Developmental Neurobiology. It is a powerful technique to reveal the secrets of the developing nervous system. Tritium (³H) radiates beta particles (high speed electrons) that are relatively low-energy and will not penetrate skin. Since beta particles do not travel far in tissue, tritium is an excellent isotope to use for autoradiography because it can be accurately localized to an individual cell. We usually injected ³H‑thymidine subcutaneously into the dorsal pocket of loose neck skin behind the head in rats. A subcutaneous injection is more slowly absorbed than an intraperitoneal injection, and the labeled thymidine is accessible to dividing cells for a longer time. Any labeled thymidine that is not absorbed is eliminated in the urine within a few days after injection. Thymidine will only be absorbed by proliferating cells in the S (synthetic) phase of mitosis and be incorporated into the DNA in the cell nucleus. Cells cannot distinguish between labeled and unlabeled thymidine; development continues in the normal sequence without any disturbance as long as the cell has not absorbed too much radioactively-labeled thymidine. In rats and mice, as opposed to primates, the blood brain barrier is completely permeable to ³H‑thymidine at all stages of development and maturity of the nervous system. Therefore, all proliferation in the brain and spinal cord at the time of the injection can potentially label DNA without any “blind spots.” When pregnant rats are injected, the labeled thymidine readily passes into the mature brain of the mother as well as through the placenta into the blood circulating in the brains of the embryos. Dividing cells that absorbed ³H‑thymidine pass on their labeled DNA to their descendants. Many of these descendant cells differentiate into neurons and stop proliferating because neurons are postmitotic cells. The label they inherited from the “ancestor” precursors will remain in the nucleus for life. That label can be detected by ³H‑thymidine autoradiography while the neurons migrate and settle as the nervous system matures. To insure that the cells are not killed by the absorbed radiation, our laboratory always used a LOW SPECIFIC ACTIVITY of tritiated thymidine (approximately 6 Ci/mmole) and injected 5 µCi/g body weight. We also separated multiple injections by 24 hours so that we would label a single synthetic (S) phase of mitosis only once. Absorption of labeled thymidine from 2 injections only a few hours apart will kill cells. When injections were separated by 24 hours, we never noticed any difference between rats that were radioactive and normal rats. Consequently, the way we administered multiple radioactive injections did not appear to interfere with normal development. This method reveals labeling patterns in identifiable neuron populations that are differentiated and settled in various parts of the mature brain and spinal cord. Pregnant females were injected with ³H‑thymidine on two consecutive days from embryonic day (E) 11 through E21. E1 is the morning that each pregnant female is sperm positive. Some neonate rats were injected with 4 successive daily injections, others were given 2 sucessive daily injections. The use of multiple thymidine injections produced comprehensive labeling. The days of the injections were separated by 24 hours in each group. In the pregnant rats, for example, one group was injected on E11 and E12, another group on E12 and E13, and so on until the last group was injected on E21 and E22. (Birth usually occurs during the early morning of E23 or Postnatal [P] day 0.) This is the progressively delayed labeling part of the technique. The purpose of the multiple injections was to overcome the problem of label dilution so that neurons generated 2, 3, or more days after the first injection could still be detected as labeled. This is the comprehensive labeling part of the technique. Within the entire range of labeling groups, we could usually find one or two injection groups that showed 100% labeling for a given neuronal population. In that, and subsequent labeling groups, we made the assumption that unlabeled cells were generated before the injections began, labeled cells were generated after the injections began. By analyzing stairstep drops in the percentage of labeled cells from one injection group to the next, we could determine what proportion of a neuronal population is generated on specific days of development—what we called neurogenetic timetables. The use of multiple injections was our key to unlocking the tremendous order that exists in developmental sequences between and within neuronal populations that are synaptically interacting throughout the central nervous system. Because we could accurately determine these timetables, we knew when to look for specific populations of labeled neurons in the developing nervous system using short-survival and sequential-survival autoradiography after single injections (explained below). Survival to E21: These embryos that were removed from their dams on E21 after their mothers were injected twice on successive days during earlier development. The E21 survival series is useful to study the earliest-generated neurons residing in the brain and spinal cord; they are the only survival group where injections began on E11. By E21, neurons have already settled in the early-developing parts of the brain, and various populations can be identified. See all the specimens on the ARCHIVED E21 SURVIVAL IMAGES page. Survival to P5: These infants survived to P5 after their mothers were injected on two consecutive days beginning from E13 to E21; these animals were decalcified and the whole body was preserved so that we could study the brain, spinal cord, and peripheral neurons. This survival series is very similar to an adult survival series. By P5, most neurons are settled throughout the brain and spinal cord. Unfortunately, we are not able to archive the large library that contained 60-day-old adult animals exposed to ³H‑thymidine using the same injection schedules. However, the ARCHIVED P5 SURVIVAL IMAGES will substitute for the lack of an adult survival group. Survival to P10, P20, P40 and P60: Still other rat groups were injected with ³H‑thymidine on either 4 or 2 consecutive postnatal days and survived to P10, P20, P40, and P60. These groups allow analysis of the very late generated neurons in the olfactory bulb, hippocampus and cerebellum. The three pages with these image sets are: NEUROGENESIS IN THE DEVELOPING RAT HIPPOCAMPUS, NEUROGENESIS IN THE DEVELOPING RAT CEREBELLUM, NEUROGENESIS IN THE DEVELOPING RAT DENTATE GYRUS. This method reveals the locations of proliferative compartments in the developing nervous system. The labeled cells are the precursors of neurons-not neurons, because all neurons are postmitotic. Glia, the supporting cells of the nervous system, are mitotic and are also labeled with radioactive thymidine. One major drawback of thymidine autoradiography is that neurons and glia are difficult to distinguish. Pregnant rats were given a single injection of ³H‑thymidine between 8:30 and 9 a.m. on specific days of gestation, beginning with E12. Two hours later, the dams were killed with an overdose of pentobarbital, the abdominal cavity was opened, and the embryos were removed and processed for thymidine autoradiography. The E12, E13, and E14 embryos were embedded in methacrylate. Methacrylate interacts with photographic emulsion to increase the level of noise—randomly arrayed reduced silver grains. We have archived some sagittally-embedded slices where there is a good signal (label absorbed by proliferating cells) to noise ratio. From E15 through E22, the embryos were embedded in paraffin and slices were processed for autoradiography. Because we knew the neurogenetic timetables for specific populations from the long-survival autoradiographic series (#1 groups above), we could more accurately determine the locations of the germinal sources that generated specific populations of neurons on specific embryonic days. The ARCHIVED 2hr SURVIVAL SPECIMENS page explains the methods for this group in greater detail. This method highlights the migratory pathways of heavily labeled cells outside the germinal zones in the brain and spinal cord. Pregnant rats were given a single injection of ³H‑thymidine between 8:30 and 9 a.m. on specific days of gestation, beginning with E12. 1 day, 2 days, or more days later, the dams were killed with an overdose of pentobarbital, the abdominal cavity was opened, and the embryos were removed and immersed into Bouin’s fixative. Histological slices were processed for autoradiography. In this website, we are only showing the 24 hour survival group, although we were able to follow cell migration for up to 5 days for each injection time. Especially in the developing neocortex, the 24 hr survival group is very informative. Because we knew the neurogenetic timetables for specific populations, we could more accurately determine the identities of many migrating neurons. The ARCHIVED 24hr SURVIVAL SPECIMENS page explains the methods used for this group in greater detail.